Bubble tea, mochi, matcha lattes…Americans love Asian desserts and drinks. Since it’s summer and ice cream is on on everyone’s mind, how about trying rolled ice cream? This Thai treasure is all about the preparation, though it tastes pretty dang good, too. It’s unusual, cute appearance makes it perfect for Instagram foodies. Asia is pretty much the capital of frozen desserts. Food historians say China created the first ice creams and if you look back at Japanese literature, you can find references to delicious creations dating back 1,000 years. Rolled ice cream, also known as “stir-fried” ice cream, has only been around since 2009, but it’s taken over the globe in very little time. Thai street vendors created the treat and in 2011-2012, rolled ice cream started becoming more popular, spreading to Malaysia and Cambodia. Thanks to viral videos of the rolling process in 2015 and lots of Instagram photos, the rest of the world jumped on board. One of the most popular channels called “Ice Cream Rolls” gets millions of views each week. You begin with a milk or milk-alternative liquid base. This is poured on a very cold metal surface. As it freezes, the ice-cream maker works it around with little paddles, adding ingredients like cookies, fruit, and so on. This process is similar to kneading bread and making sure all the ingredients are incorporated nicely. The ice cream ends up flat and even. Using a metal spatula, the ice cream is rolled into neat little strips. The whole process takes about two minutes. The rolls are put into a bowl or cup, and topped with whatever goodies the customer’s heart desires. Where can you get rolled ice cream? You can find rolled ice cream in just about every major American city these days for around $6-$7 for a generous serving. A lot of the stores tell the same story: they learned from watching viral videos. That’s how the owner of 22 Below in Oregon got started, and in just a few years, the shop now has three locations. They use a vegan coconut-milk base and a pan cooled to -22 degrees, thus the name. They have over 30 flavors and toppings like hot cheetos, toasted marshmallows, and candy. Also on the West Coast, LA-based Holy Roly makes organic rolled ice cream for sundaes like “Ferrero Rocher,” which is a dark chocolate ice cream with Nutella, almonds, and Ferrero Rocher chocolates, and “Earl Gray,” which is an earl gray ice cream topped with honey and almonds. 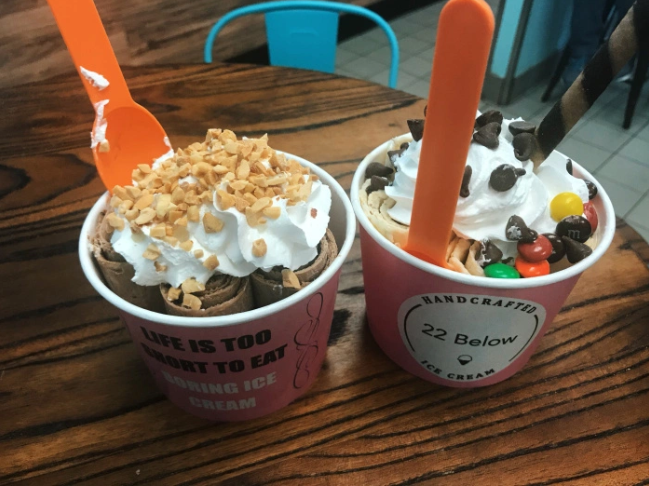 Go across the country and you’ll find IcyCode Ice Cream Rolls in Washington, D.C. Their summer-ready creations include Banana Split, S’mores, and Matcha Honey. If you’re closer to the middle of the country, check out Aha Crepe in Chicago. They serve seven flavors with names like “Mr. Reese” and “Chili Cream.” This spot is also a restaurant that makes rolled savory crepes, so stop by for lunch and dessert. A lot of places that make rolled ice cream also serve bubble tea. Do you know how this sweet drink got started? Track Days: Can You Really Race Your Own Car?